The children living at the Reynolds Home have lived through many obstacles and experienced much loss. 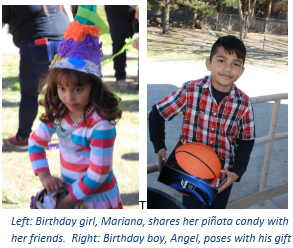 But on Saturday Feb. 25, with the sponsorship of Holy Trinity Church, six birthday children and their friends got new memories, shared many smiles and laughs, and received new toys at the monthly birthday party celebrated at the Home. The smiles were definitely flowing at the party. 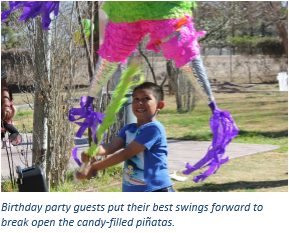 Children eagerly lined up to take a swing at the candy-filled piñatas and enthusiastically rushed to get their fill of sweets once they were broken. They gobbled down their lunch, cake, and ice cream, of which the only evidence that remained was what was smeared on their faces. Each birthday child received a gift provided by the parish’s confirmation students. Their mothers were also gifted with a basket from Avon so that they could have some items to pamper themselves. The Reynolds Home would like to thank Holy Trinity for their gracious sponsorship. You are forever part of the family! 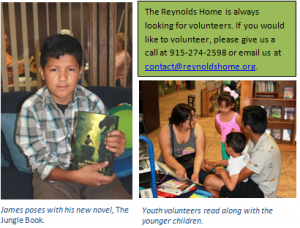 The Reynolds Home Host a monthly birthday party and is looking for sponcers for coming months. 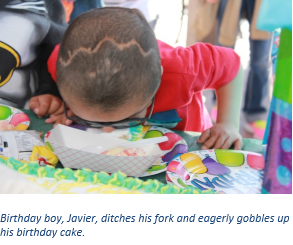 If your organization would like to sponecer a birthday party, please give us a call at 915-274-2598 or email us at contact@reynoldshome.org. Every child looks forward to a break from school. No early wakeup times, no tests, and no homework. Spring break offers lots of relaxation and free time, but this can often leave parents in a bind when it comes to childcare and finding activities to keep their children entertained and out of trouble. The moms living at the Reynolds home were able to go to work with peace of mind knowing that their children would have a week filled with exciting and stimulating activities. One such activity included a visit to Books are Gems. 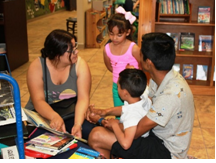 Six of the school-aged children accompanied three youth volunteers to the non-for-profit bookstore to receive six free books each. The children eagerly chose their books, burrowed into chairs and read with great enthusiasm. Some of the younger children practiced their reading skills with the volunteers, and others participated in coloring and mind-game activities. “This was a lot of fun for me because I love reading fiction and non-fiction. I plan to read all my books by the end of the month,” Sarai, a fifth grade student and the oldest child currently living at the Reynolds Home, said. “All of the activities we planned allow the children to not only have some fun during their spring break, but they are also meant to provide them with enrichment,” HaninElhoujeiri, an EPCC youth coordinator, said. Other activities for the week included movies, pool time, park activities, downtown exploration, and a zoo day. All activities were subsidized by grant monies.